Finally! Spring is here and within three days, the cherry trees have gone from bare to bloomed. To share a little of that with you, I’ve trotted over to my neighborhood playground to take a few photos. At the risk of sounding like a broken record: Jackets are the foundation of a professional wardrobe. When you put a jacket on, you are automatically dressed up and that’s true even if the jacket is cotton poplin. A safari style jacket dresses up jeans and allows you to enjoy the esprit de corps of Casual Friday with a little polish. What looks good with navy? Navy and white is an unbeatable combination. But in smaller doses, I also like yellows (lemon yellow and yellow-orange), turquoise and robin’s egg blue with navy, as well as certain pinks under certain circumstances. Circumstances like this fantastic Indian-print scarf. Don’t forget your big sunglasses! I ordered this pair from Illesteva this spring and was very impressed with both the quality of the product and customer service when I had a few questions about the fit. A little bit about the cherry blossoms . . . They are enchanting. If you haven’t seen them, you must come visit. 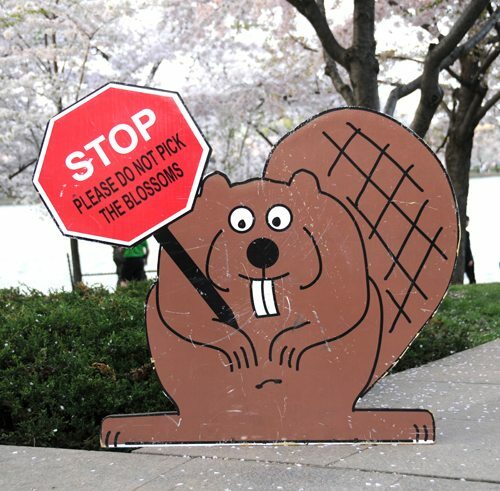 A number of years ago, the Park Service was thrown into a low-level panic when it was discovered that some industrious beavers were implementing an ambitious redevelopment plan for the Tidal Basin. After leading the Park Service on a merry dance for a week or so, the beavers were trapped and relocated. Several years later, the Park Service launched a new campaign to discourage tourists from taking souvenirs from the trees. Can you imagine how incensed the beavers would be if they could read? Their image appropriated to sell a campaign that is antithetical to their work ethic . . .
UPDATE July 15, 2015: To see more of this splendid scarf, see Casual Friday: For the Urban Safari. Yes, but would the beavers look as chic wearing this scarf on their casual Friday gnaw-fest? I think not. LOVE this scarf. It doesn’t take itself too seriously. I agree: I love jackets. But long arms + long waist + narrow frame = frequent jacket fail. Perhaps I should look into alterations? I see the problem. I would do two things. First, look for jackets that are more amenable to . . . self-help. Jackets with belts or adjustable tabs at the waist. Even if the tabs on their tightest setting leave the overall fit loose — buttons and tabs are easy to relocate and a tailor could do that for you. Second, look for jackets that will permit more intrusive alterations. For a jacket that doesn’t have adjustable settings, a tailor could take it in along the side seams or could even create darts on the back to create a better fit. Such alterations will depend on the overall design — whether there is a set waistband, pockets, etc. — but are worth discussing with a professional. I recommend Fatima at Bespoke Tailoring, 1100 New York Ave NW; she’s helped me figure out how to alter many things and she has a great sense of fun and appreciation for clothes, too. Tell her I said hello! It is so helpful to see such chic, fun, grown-up looks. Also, I LOVE your hair!